Discussion in 'Transformers 3rd Party Discussion' started by Superquad7, Apr 15, 2019. Holy crap! 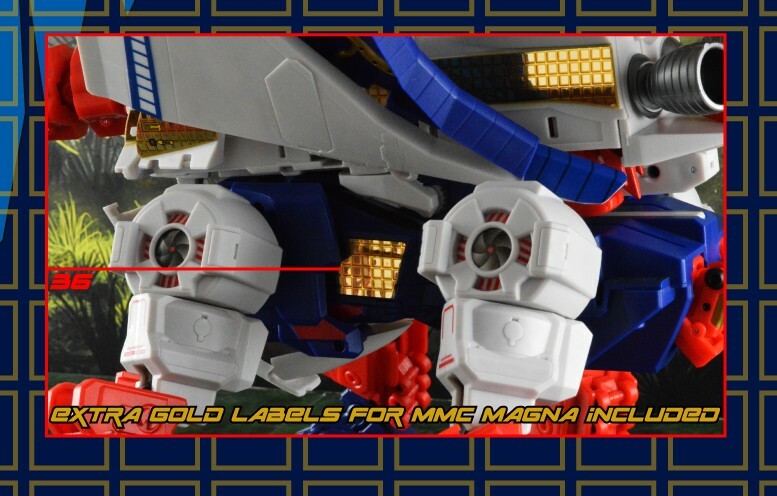 Are those raised details on the gold stickers for Skylynx's sides?! If so, I freakin' need these! [Edit] It's kind of hard to tell. In this pic, it looks like the squares are raised. But in this one, it looks like they're flat stickers. I'm guessing they're flat and the texture is an optical illusion created by the inked lines having different reflectivity to the gold squares. I'm not a huge fan of covering raised/engraved details with flat stickers but I might just have to buy this set anyway. That just looks too good. I'm a little disappointed in the autobot symbols, though. Was hoping for large chrome backed symbols like the G1 figure (mirror gold, not flat metallic gold). And still, no labels for Fanstoys Caesium. I was hoping (and even sent an email to them suggesting it) that for a Siege Soundwave set they'd include optional chest decal "Cassette Man" to make him look more like his pre-TF Microchange/Microman version. I'll pass on this set, but maybe Toyhax will make a Diaclone/Microchage specific sticker set someday and I'll be down for that! That is a dynamite idea! I'm sure that's a cheaper method of attaining the "Seige" effect? Just skip their autobot sticker all together, usually sux anyways, unless it is the white clear ones. It's those gold bits that are MUST have, especially on the "eyes". They dont do raised face stickers to my knowledge, assume it is standard flat always. Yeah, after much scrutinizing, they're definitely flat stickers. Was curious because they have done raised stickers in the past - they have raised faction logos and their set for MP Hot Rod had raised treads for the tires. I would've been blown away if they did raised squares for Skylynx, though - I don't even know how you'd pull that off with reflective stickers. Stamp the pattern into the foil from behind and then fill it in with some kind of spongy substance before adding the adhesive background - definitely possible but it'd be a lot of trouble to go to. Now what I'm trying to determine is how well the grid pattern lines up with the pattern on Inventa. If it's exactly the same, you could just rub the stickers down really hard to make the recessed grid show through. Also is that an actual gold rubsign for his forehead or just a sticker that looks like one. I know they do rubsigns (I've gotten them before and they're ok'ish - not as good as the original G1 versions) but I'm curious if that's actually one of them. If it's real, that would be an awesome touch to put on Inventa, but if it's fake, I'd rather not. Oh well, already spent my toy budget for now. I'll wait and see if someone reviews this set and then decide whether to get them. Okay I’m only looking at the stuff I care about and is most relevant. VW Bumblebee: I don’t get the cell shaded windows. It’s a nice cover up of the insides but it looks so off. The other g1 homages are nice and I like they recreated the beetle from ‘07. But it’s a pretty minimal set. Target Soundwave: Really string design. The gold on the dark grey and blue is really nice. But come on, a security station is not as good as dancitron. Battle Damage Labels: Incredible. Absolutely love this idea and it’s well executed. Tones of great options for damage styling. I love the logos and how they each have their own different damage effect. You get these and put them across a figure you can make them look pretty good if you can’t already do weathering or painting battle damage. Really good set. MP-29+ Laserwave: Nice simple set that adds bonus stuff. Better than just some cell shaded windows. MP-20+ Wheeljack: I get the cell shaded windows are the appeal here and it would’ve been nice to get a proper colour matched recreation of the race logos. But they seriously can’t match the green for three small spots? It’s a bit disappointing. Siege Soundwave: Yeah pretty good set. The chest options are great and a nice alternative to the stock damaged version. Yeah it’s a pretty nice set. Not much. It adds extra detail and there’s some nice references. Siege Starscream: Okay yeah this is the best one. 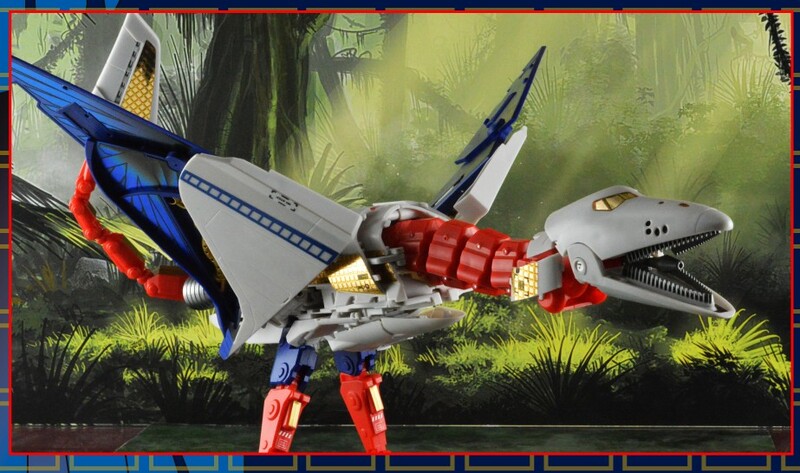 Seriously this makes starscream so much nicer. The jet mode specifically. It looks so complete. With the red and the and fin up top. The extra detailing like the metal doors and flaps and the shiny orange heat exits and thrusters. Then the robot mode is far more interesting. With the the livened wings. The shoulders and the complete vents up top. It’s a great set and makes the figure far more worth while. Man, I was excited for MP-29+ until I saw that they ONLY had a cell shaded option. I'd be all over a similar sticker with no cell shading effects. Gotta get me that Soundwave set for the black chest, and the Bee Soundwave set for those Functionist propaganda stickers. Oh, and that battle damaged set is pure gold. One of the best toyhax sets this year so far. Decided to go ahead and pull the trigger on the Skylynx sets. As much as I love Magna Inventa, he is pretty plain looking and the stickers should help with that. I'm also doing an experiment where I'm putting clear backed waterslide autobot symbols on gold foil tape - looks like the papery texture of the decal disrupts the shine of the gold a little but once it's dry I'll try shining it back up with future and see how it goes. If it goes well, I'll have gold symbols for his wings. If not, I'll probably just get some of toyhax's gold backed symbols - they're not as shiny as I'd like but I can't justify paying for a G1 Skylynx repro set just to get the gold symbols. The CW Sky Lynx set has a very nice set of large gold-chrome insignia, and is cheaper than the G1 set. I have no idea why they didn't include any in this set, I figured they might even just re-use the CW ones. I'll check FB. The guns he had on Ebay but no feet. Well damn. Should have narrowed my search parameters. Anyone one know how long it usually takes to get a label sheet from Toyhax? Had a shipping notice on April 9, and was wondering if the wait was typical to somewhere like the Chicago area.